Finely ground, slowly water soluble powder. Suitable for injection through irrigation systems. Soil potassium deficiency, soil magnesium deficiency, soil sulfur deficiency. Can be applied through irrigation: drip, sprinkler, or pivot. 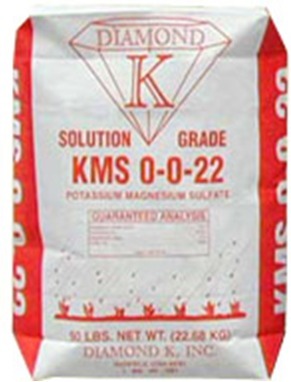 Click here to see Fertigation Machines made to apply Diamond K Gypsum, Potassium Sulfate, and KMS (Potassium-Magnesium Sulfate) through your irrigation.